The aubergine is a curious vegetable. At some point in its history, it must have looked like an egg, hence one of its other names, eggplant. It is related to the tomato, the potato and tobacco. The numerous seeds in an aubergine classify it also as a berry. The aubergine is a star in many cuisines, South Indian sambar, baingan bharta, Chinese stir fries, Japanese tempura, Greek moussaka, French ratatouille, baba ganoush from the Middle East and the Turkish imam bayildi among them. Almost every country has a popular recipe featuring the aubergine. Slice aubergine into thin slices, sprinkle a little salt over the slices and leave for about 1/2 hour. Squeeze out water from the aubergines. Heat oil in a skillet and fry half the slices till golden, drain on absorbent paper and keep aside. Repeat with the remaining slices. Remove all but 2 tablespoons of the oil; sauté the onion, carrot, celery, garlic, bay leaf and thyme. Add in prepared tomatoes and torn basil leaves. Cover with a lid and simmer till thick. Discard bay leaf and thyme stalks. Cook macaroni in boiling salted water till done, drain and keep aside. Grease an 8” oven safe dish. Spread a couple of spoonfuls of the tomato sauce, put half the macaroni over it. Spoon half the sauce over, sprinkle Parmesan cheese over this layer. Arrange half the aubergine slices over, then half the mozzarella slices. 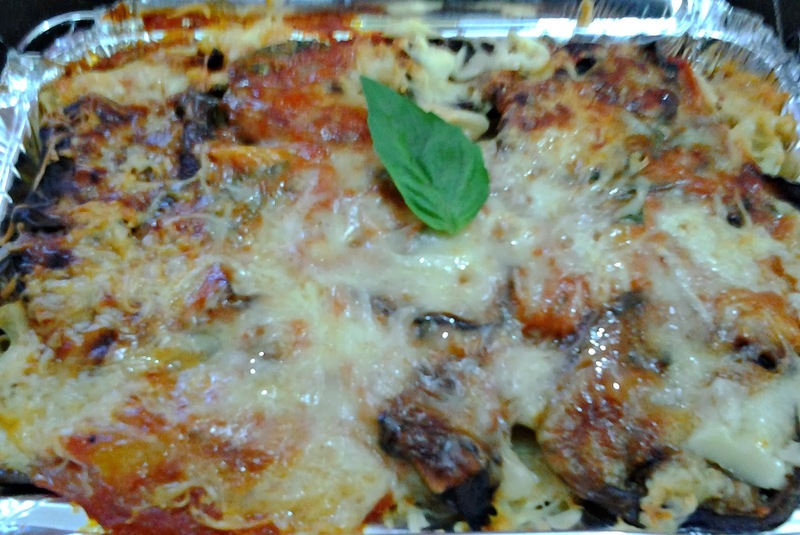 Top with the remaining macaroni, aubergine slices and mozzarella slices. Spread over the remaining sauce.